Up to £750 Accident Damage Cover at John Lewis Pet Insurance If your canine companion gets too boisterous and causes accidental damage to a third party, be covered for up to £750. Up to £1m Third Party Liability Cover with the Essential Policy at John Lewis Pet Insurance Be covered to the cost of £1m in damages with liability cover on the essential policy at John Lewis Pet Insurance. 5% Off with Second Pet Policies at John Lewis Pet Insurance Get a second pet insured at John Lewis Pet Insurance and save 5% today! Up to £12,000 Vet Fee Cover with the Premier Policy at John Lewis Pet Insurance Emergencies happen, but let John Lewis take care of any unexpected costs so you can focus on getting your four-legged friend better. Get your vet fees covered up to the value of £12,000 with their premier pet insurance. 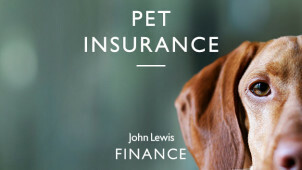 Life Time Cover with Essential, Plus and Premier Policies at John Lewis Pet Insurance From pup to old dog, your beloved pet will be covered no matter their age with John Lewis Pet Insurance. 24 Hour Vetfone Helpline at John Lewis Pet Insurance For those days where you can't get to the vet but you need some answers and reassurance. Get advice from trained veterinary nurses any hour of the day with the Vetfone helpline with your pet insurance policy. Up to £1,500 Cover for Lost or Stolen Pets with Premier Policies at John Lewis Pet Insurance Get covered with John Lewis's great pet insurance policies today! For complete peace of mind for your pet, put your trust into John Lewis Pet Insurance. With 3 comprehensive policies available, all including Lifetime Cover - now you've got the help that you need to fund yearly treatments and day-to-day or one-off mishaps. Choose from Essential Cover, Plus Cover or Premium Cover and save on your quote with vouchercloud. Not only does John Lewis Finance understand your pet's needs, but by taking into account your needs too - here is where you will find a policy to match your pet pal, lifestyle and budget. With vet fees, dental care, accidental damage (including to other people's properties) and more as part of all 3 policies - compare the finer details online to find one that'll suit you best. Done are the days of worrying over increasing health expenses and even hefty fees abroad, your pet is in safe hands with cover from John Lewis Pet Insurance so you can enjoy your time together and be prepared for any of life's throwbacks. How do I use my John Lewis Pet Insurance promo code? Any other discounts will automatically be applied to your quotes so you can choose the cover and pricing option to best suit you. Buy your Pet Insurance online and you'll get 10% off! Do check the Terms and Conditions. How do I make a claim with John Lewis Pet Insurance? Be sure to include your pet’s full medical history too. You can also call 0330 102 2756 or 01422 501070. Can I insure more than 1 pet with John Lewis? This is possible, however, should you need cover for more than 3 pets you should call 0330 102 2615. How can I retrieve a previous John Lewis Pet Insurance quote? You can find a previous quote online should you want to continue to purchase this cover offer. You will need your quote reference and the postcode used. How can I renew my John Lewis Pet Insurance policy? Your policy will automatically be renewed if you pay by direct debit unless you have notified John Lewis of your wish to change or cancel your policy. You will be informed of the premiums and Terms and Conditions which will apply for the next year at least 21 days before the renewal. Should you be paying by credit or debit card, a further payment will need to be submitted. You have the right to cancel your policy within 14 days of receiving the documentation. Call or write to John Lewis as specified on your policy schedule. Call Customer Services on 0330 102 2745/01422 501069 Monday to Friday, 8am to 8pm, Saturday 9am to 5pm and Sunday 10am to 4pm. Email: using the online form. You can call the Vetfone Helpline 24 hours a day, 365 days a year on 0800 316 7119.
Who doesn’t want the best for their family? Anyone with a pet will know that they’re included too; so for the furry friends in your life - you can trust John Lewis Finance to get you comprehensive cover to keep your pets healthy and happy! It’s easy to make great savings with a John Lewis Pet Insurance promo code from vouchercloud. Medical treatments, checkups and more can all be accessible for less with one of their fantastic policies. John Lewis Finance will not only help you protect the health of your pet and your finances - but with plenty of tips and advice online too - this is a one-stop shop to the overall brilliant well-being of your pet. Covering Health, Safety, Behaviour, Diet and Exercise - here is where you could find vital snippets of information to improve your pet care and enhance both of your lifestyles even further. Lifetime Pet Cover at John Lewis Finance means that with yearly policy renewals, there will be no time limit on however long a treatment may last. So for illnesses such as diabetes or an accident which has caused a cut paw for example, with a John Lewis Pet Insurance discount code from vouchercloud you'll be able to save on Lifetime Cover across all 3 levels of insurance which are offered. There's no better way to keep your finances intact whilst caring for your pet.